Knitting machine has arrived at its destination in Iceland. A few problems with operation, but I’m really hoping it’ll sort itself out. The thing is that the actual journey may have caused the problems – these are sensitive machines and the slightest thing can cause it to play up. Haven’t been well since Sunday night. This is the first day I’ve been up, showered and dressed, and am feeling like a normal person. It was a very odd virus indeed. I thought I was going to vomit the whole time, but didn’t. Nothing like that at all, though my tummy was going crazy. Also very, very giddy and weak. So three days in pjs, in bed, not eating. Just as well I carry half a stone extra in weight for just such an eventuality, as I’ve lost five pounds. It’ll all be fine, it’ll go back on again now I’m back to normal. And it was such a shame it happened just then because ED came to stay on Sunday night, and went home yesterday. It was lovely to see her looking so well and happy. Would have been even better had I been able to join in stuff! Mobile phone saga. Aha. My HTC Wildfire S has been annoying me for some time, and I really wanted an iPhone. But my provider is Virgin, and they don’t do iPhones. So I had to set up a second contract, as the current one doesn’t run out till August 2013, and I just can’t stand the hassle with the old phone that long. Ordered a Nokia Lumia. I knew it ran Windows, but never in a million years did I think that it wouldn’t sync with my Google calendar! which is the whole point of the phone for me. So that had to go back, and I’ve got a Samsung Galaxy SIII which is absolutely perfect. The trouble I had on the phone to Virgin though. I can’t understand most of their support personnel and they don’t have the information they need, just a crappy script they have to get through. All the sales personnel are clear and helpful – strangely (!) hmm. The old phone did go back, but there was no jiffy bag to put it in. The courier said that was fine. It wasn’t. It appeared back at my house again yesterday. I phoned Virgin and they tried to tell me that the Post Office would accept a Yodel delivery bag. I had my doubts, and it took 4 circles round that loop before they decided they’d send me another bag. Which arrived today and is a Post Office bag. Thank heavens. Virgin emailed me for feedback. Well, they got it right enough. No holds barred. Interestingly, while I’ve been in bed, my hand hasn’t been painful. Probably because I wasn’t doing anything to make it hurt. So I stopped taking the Tramadol. Bad, bad, bad idea. Withdrawal symptoms – very odd. Like little doors going swish, swish, swish, in my head. I recognised the symptoms from when I had to stop taking Venlafaxine (an antidepressant) cold turkey. So I started taking the Tramadol again, but a much reduced dose, and the swishing has gone away. Still no pain though. We will see. I’ll keep trying to reduce the dose to nothing and we’ll see how we go. Expecting my friend from Stitch today – soon maybe. I won’t be able to make Stitch group tonight (not that much better!) and it’s Secret Santa tonight. So she’s coming to fetch the Secret Santa present and a double choc chip cake I’ve made her. She has such a busy life though I don’t know how she fits it all in. The energy of youth! Had pea and ham soup for lunch – I always find soup so warming. I only tend to have it when I’m ill though, I always think of it as invalid food. May need to restructure my thinking on that . . . then an apricot, a satsuma, then a very very small piece of cake. Excellent. What’s new? 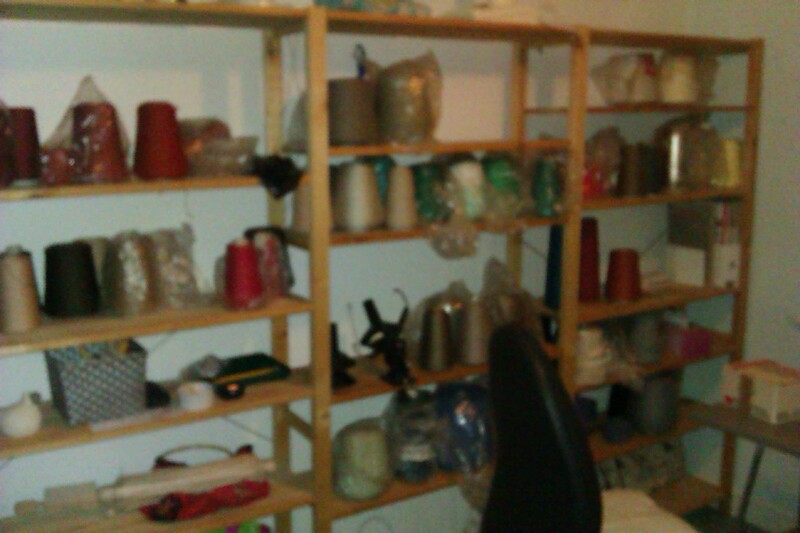 well, all the knitting stuff has been dispatched. The yarn winder also had to be sent off because the woman who was going to collect it had fallen, on the ice, and really hurt her back. The room looks much, much better without it all. Just the rest of the yarn to get rid of now. My cousin’s daughter (does that make her my second cousin?) is interested, but lives in Cornwall, a long, long way away, so the problem would be getting it to her. There is a plan afoot, but not completed yet. 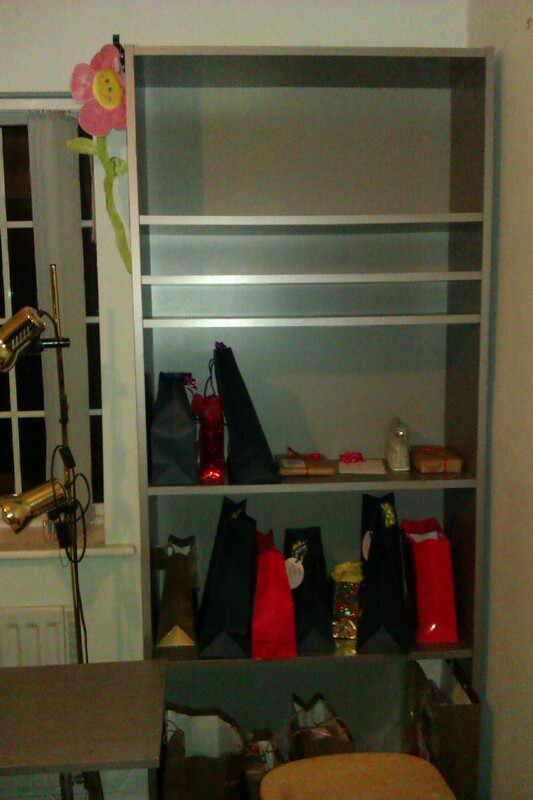 Went to see my mother today – she’s all organised for Christmas, same as we are. We have visitors next weekend, so will be putting our tree up on Friday evening, as the visitors include three of the grandchildren. I’m a bit “bah, humbug” ish about it, and can’t wait to get it down soon after Christmas, but the children love it. So does the cat, incidentally, she likes to climb the tree. We have to weight it down so she doesn’t topple it over. I’m missing knitting. Every day, normally, I have my evening saved up ready to knit. Even if I only do a few rows, it feels comforting and useful and creative. I really like the rhythm of it, even though that changes with every new thing I knit. It will be several months before I can knit again. No date for the surgery yet. The pain control is still working. Normally I’d feel as if I were on Planet Zog taking this much Tramadol, but not this time. Possibly because I increased the dose gradually, instead of jumping straight to 300 mg a day. But 300 mg a day it is, and that just about copes with it. Stupid sudden movements hurt, and I’ve had to ask hubby to peel, top and tail 1/2 a kilo of carrots for me so that I can make a carrot cake (actually, two) ready for next weekend. I have made a dairy-free fruit cake this week. It is 800 gm dried fruit (I added glace cherries too), 475 ml orange juice, and two cups self raising flour. And that’s it! this time I added a layer of marzipan half way up each cake, and froze it in slices. So that’s me sorted for Christmas. Nobody else likes fruit cake, or marzipan, in my family, only me, that’s why it’s frozen in slices. Otherwise I’d eat it all in a week and put on two stone. Hubby had to help with the mixing and the pouring into the loaf tins, though, as it’s quite a heavy mixture altogether. Now I have got rid of the knitting software (DesignAKnit 7), I don’t need Windows on my laptop. So this evening I’m going to install Linux Ubuntu instead. It’s quite an old laptop now, it’s a Lenovo (used to be IBM) and a good one, so I think Ubuntu will mean it speeds up quite a lot, as it’s much less hardware resource-hungry than Windows. I just need to sort out the spec of the laptop and that will inform which version of Ubuntu will work best on it. Hooray. My main computer, downstairs, has both Windows XP and Ubuntu 12.04 installed on a partitioned 1Tb hard drive. When it’s switched on it goes into Ubuntu: if I want to boot into Windows I have to sit and watch the boot process, and choose Windows. I think there’s a ten second delay before it automatically goes into Ubuntu, and I could choose to have it boot by default into Windows. But why would I do that 🙂 ? The only reason it’s installed on there at all is for my iTunes music for the iPod, and to access the hubby’s music server remotely. Otherwise I use Ubuntu for everything. Love it. Feeling better generally. Still tired though of course, but what’s new. Finally sorted out the pain control. 2 x 50 mg Tramadol 3 times a day, 2 paracetamol three times a day, in between the Tramadol. The background pain is much more manageable now. Still hurts like hell if I move awkwardly or accidentally bash the offending thumb, but generally speaking I can deal with it now. Sold all my machine knitting stuff on ebay. What an absolute nightmare. Really complicated, stressful, I was angry, tearful, confused, worried. But it’s almost all gone now. I’m waiting for a courier to pick up the big machine, the electronic one, which includes the ribber and all sorts of other stuff. Three boxes weighing 14 kg each, the fourth box weighs only 3.5 kg. But it took some packing up, it really did. Hubby had to help, because I just can’t manage heavy weights. And it’s all going to Iceland! Yes, Iceland! and somebody is coming to collect the electric yarn winder this week sometime. She lives in Middlesborough, which is a good 200 miles away from here (300 km) but is coming to Birmingham for the Christmas Market, so will be in the area. Just waiting for a phone call to confirm day, time, etc. 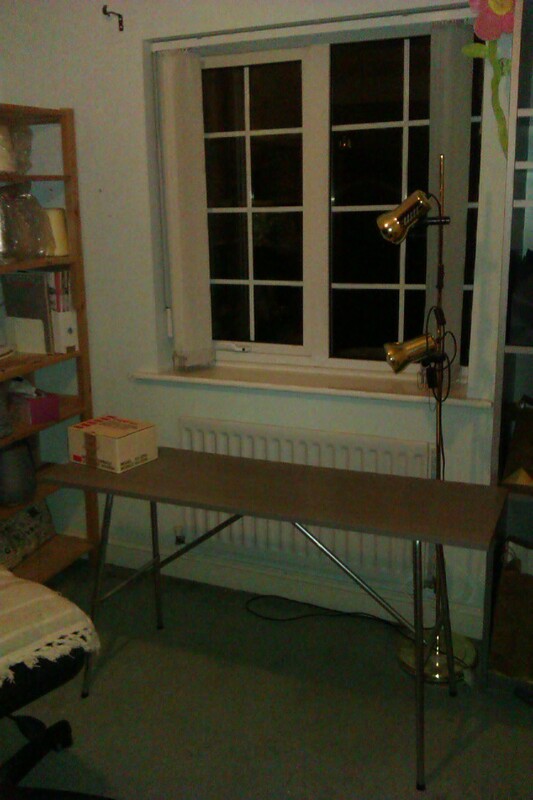 Then the next project is to sort out the room. Very exciting. I do know what’s going to happen to it, and it’s not much really, but still. Holes in walls to be filled, walls to be painted, big grey Ikea Billy bookcase to go to the knitting shop which is on the verge of opening, shelves to be moved to the other side of the room and their configuration rearranged, ooh, can’t wait. Today I have done my ironing and for the first time in years managed to burn my arm. Bummer. Also have sewn 1″ wide elastic strips, one each side at the bottom, of the fitted sheets which are too wide for the bed. The plan is that I can tie them up under the bed, to stop the sheet travelling in the night. I end up with a horrid wrinkly sheet in the morning because I’m such a restless sleeper, so decided this was the best option, as it’s very expensive to buy sheets to fit. We’ll see. The bed is being changed tonight, so the new amended sheets will go on then. It’s really cold here. Maximum 2C or 3C in the daytime. But I’m ok with that. When it’s very cold, it kills the germs, and helps reduce garden pests like slugs. Older daughter phoned yesterday – is coming to stay for a few days in a couple of weeks. Can’t wait. Also, hubby’s eldest son is coming up at some point from Brighton (a good 3 hour drive) with his three children and his partner. Very exciting. Am all ready for Christmas, presents bought, just need to do some baking. Two chocolate cakes, two carrot cakes, and two dairy free fruit cakes (for me! ), which I will freeze in slices, as only I like it, and nobody else. The carrot cakes go in the oven together, so do the fruit cakes, but I have to make the chocolate cakes separately, as the food processor just doesn’t cope with the quantities. Starting this afternoon as I didn’t wake up till 11.30 am, with one of the chocolate cakes. Will have to stop now. More anon.